This system consists in confining the facade between the slabs of the building, getting the stability before the wind arch effect. Eurocode 6 recognizes the structural provision of masonries that only act with the role of enclosure walls. Therefore, you can and should calculate the facades. From the result of this calculation we can deduce a number of conditions which the facade must meet 1/2 foot-thick brick to ensure its structural performance. There are three of these mandatory requirements: support, height and compression of the masonry. The support of the brick in both the upper and lower floor slab cannot be less than 7cm. The wall has to be perfectly compressed against the upper floor. We have a special emphasis on the condition of confinement (which is the prerequisite to ensure the stability of the facades) which is the main cause of cracking in them. i.e. cracking must never be attributed to the pieces but to the construction system. The use of FISUFOR®/GEOFOR masonry reinforcement is recommended to minimize the risk of cracking. Eurocode 6 recognizes the incorporation of masonry reinforcement in walls with masonry to improve the ductility of them, restricting most of the risk of cracking. Homogeneous reinforcement: Consists of the placement of FISUFOR®/GEOFOR reinforcement, evenly distributed in the entire length of the wall. 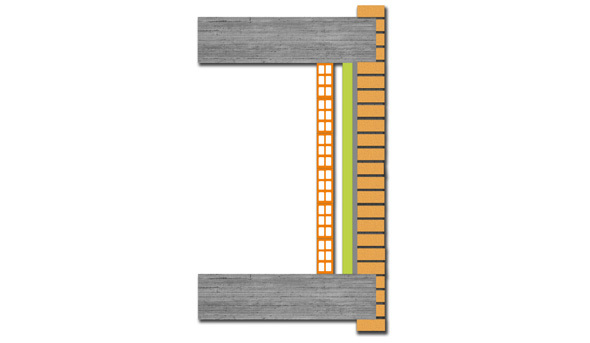 According to Eurocode, a masonry is reinforced when the reinforcement has a steel section of at least 0.03% of the gross area of masonry; and a vertical separation between these reinforcements does not exceed 60cm. This means that, for a wall that is 11.5cm thick, it is sufficient to put 4mm diameter reinforcement every 60cm. Localized reinforcement: consists of the placement of FISUFOR®/GEOFOR reinforcement only in those places where it is more likely to be cracking. Obviously, this way of reinforcement does not comply with the explicit requirements of minimum amount of reinforcement in the Eurocode (For more information about this type of reinforcement, please consult the FISUFOR®/GEOFOR catalogue). In this regard, we stand up for construction companies, given the low tolerance that this constructive system has to fulfill for the condition of support. Any minimum variation, on the other hand inevitable, in the layout of the formwork of the slab edge can lead to a significant decrease in this condition. This problem is accentuated proportionally to the number of floors of the building. A possible solution by screeding slabs is unworkable for obvious economic reasons. The solution proposed by STEEL FOR BRICKS is a recalculation of the masonry, according to the Eurocode and the return of the condition of stability through the use of GEOFOR masonry reinforcement and FISUANC® anchors. - It is the most economical solution in the market that complies with the Eurocode. - The implementation does not have to be general. Can only act in the areas where it has lost its stability. - It is quickest and easiest solution to execute. The auxiliary elements (GEOFOR and FISUANC®) can be placed by the bricklayer, without needing specialist skills or expert knowledge. It is important to emphasize that the brickwork support system used conventionally to solve these situations, work as elements of retention, not as element of support. Therefore, it’s an element that can perfectly be replaced by FISUANC® anchors. The angles only work as a support at the start of the walls or when there is a horizontal joint under the same. These horizontal joints are especially sensitive because they cancel the confinement of the walls, leaving it precarious in stability, making it impossible for arch effect calculations and making it necessary to use retaining elements( such as FISUANC® anchors). Walls exceeding 3.00m in height between floor slabs. In these cases, in order to guarantee stability it is necessary to increase the condition of delivery. 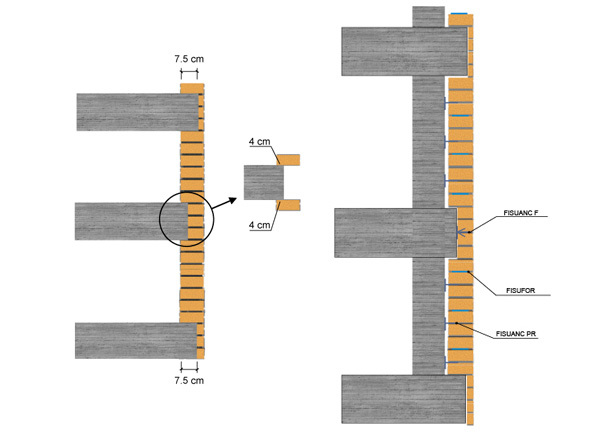 When this is not possible because the wall is going to have 11.5cm in thickness, it is essential to move to the calculation per plate, which implies the use of GEOFOR reinforcement and FISUANC® anchors. Compression to guarantee head reaction. This type of masonry has the peculiarity of being loose in the head, since they are not confined in the masonry, neither vertically nor horizontally, therefore they cannot obtain stability due to the arc effect. Its stability can be obtained by doubling the thickness of the wall and tying two leaves with the GEOFOR reinforcement. This solution is only viable for parapets with a height not exceeding 1,30m high. (For greater heights consult the technical department). The strangulation of the masonry when passing through slab faces and/or supports generates a weakening of the thermal insulation of the facade and possible moisture bridges, which can lead to pathological processes associated with this situation. With the conventional systems this is a difficult problem to solve, both by its difficulty in implementation and its high cost. Use of the GHAS system. THE BEST WAY TO AVOID ALL THESE TYPICAL PROBLEMS IS TO INTERVENE IN THE PROJECT PHASE WITH A RATIONAL SOLUTION : THE GHAS SYSTEM.